^ "Remote Piloted Aerial Vehicles : The 'Aerial Target' and 'Aerial Torpedo' in Britain". Ctie.monash.edu.au. Retrieved 2012-02-13. ^ Ümit Enginsoy. "BUSINESS – Turkey aims to increase ballistic missile ranges". Hurriyetdailynews.com. Retrieved 2012-02-13. ^ "TÜBİTAK: Hedefimiz 2 bin 500 kilometre menzilli füze yapmak – Hürriyet EKONOMİ". Hurriyet.com.tr. 14 January 2012. Retrieved 2012-02-13. ^ "Türk Füzesi SOM İçin Geri Sayım Başladı – Haber – TRT Avaz". Trt.net.tr. Retrieved 2012-02-13. ^ "Yerli seyir füzesi, 180 kilometreden hedefini vuracak – Hürriyet Gündem". Hurriyet.com.tr. Retrieved 2012-02-13. ^ "Yerli seyir füzesi, 180 kilometreden hedefinin vuracak – Kirpi HABER Cesur | Özgür | Tarafsız Habercilik". Kirpihaber.com. Archived from the original on 2011-06-07. Retrieved 2012-02-13. ^ "Raytheon: Tomahawk Cruise Missile". www.raytheon.com. Retrieved 2016-09-19. ^ "Nuclear-capable Nirbhay cruise missile's test fails for the fourth time – Times of India". The Times of India. 21 December 2016. Retrieved 2016-12-21. ^ Diplomat, Ankit Panda and Prashanth Parameswaran, The. 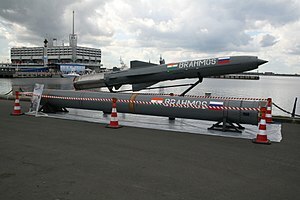 "South Asian Strategic Stability and Pakistan's Babur-3 Submarine-Launched Cruise Missile". The Diplomat. Retrieved 2017-12-01. ^ "Pakistan announces cruise missile success". BBC News. 2017. Retrieved 2017-12-01. ^ Haider, Mateen (9 April 2016). "Pakistan Navy inducts coastal anti-ship 'Zarb' missile after successful test". DAWN.COM. Retrieved 2018-01-17. ^ "Kh-101 – Russian and Soviet Nuclear Forces". Fas.org. Retrieved 2012-02-13. ^ "Cruise missile career comes to a close". U.S. Air Force, Tinker Air Force Base public affairs. 24 April 2012. Archived from the original on 20 December 2013. Retrieved 2012-12-27.